Let’s face it, when we go out for an evening, it’s usually a long affair. To top it, our mind varies with the mood & no one place is ever suitable to all our needs. So, here’s the answer to all your outing appeals – Capsule. HKV is always buzzing and we love it but either some place is too loud or too quiet for our liking. Capsule has a four-floor answer to this and it is going to blow your mind! Spread across four floors, you can go dancing, have a romantic date or just sometime by yourself at this awesome place! 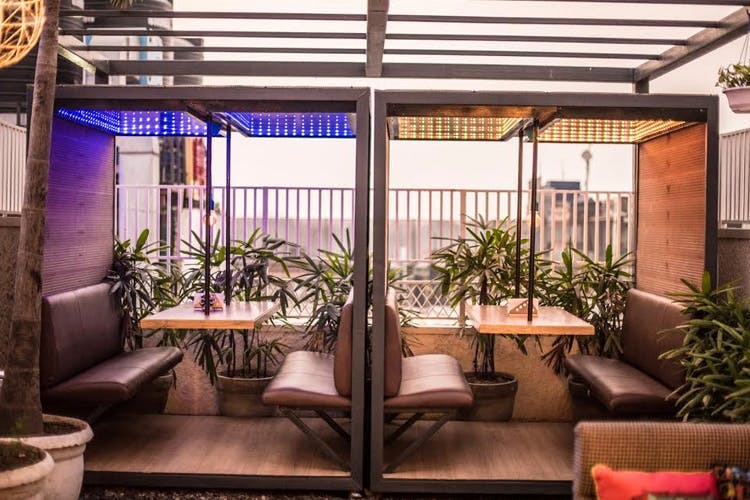 In the hustle bustle of HKV, escape to the terrace of Capsule for a cozy date with your SO. They’ve got pretty lights, hanging planters & private booths called pods to make your evening super special and conducive to intimate conversations even in a crowd! Try their Mirchi Poppers or their Peri-Peri Chicken pizza, you’re in for an absolute treat. After sharing some tete-a-tete you can shift to the dance floor downstairs and bust some moves! We love the décor, booths & their long bar. Their cocktails have such quirky names that you’re going to want to drinks from their Gulabo Bunta to their Chak De Phatte! Capsule has really upped the game of ‘ladies night’ by making it ladies only & we absolutely love it. There’s nothing better than spending an evening with our bestie, drinking & dancing away from all our troubles. Capsule is going to do a great job encapsulating all your needs. Check them out here on Facebook and Instagram for exciting updates.